Well done to everyone who has helped Fittleworth Stores and Cafe become a Countryside Alliance S.E. Region Finalist! 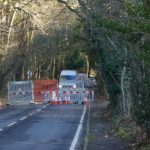 The A283 is likely to be closed possibly until Thursday, near Wyncombe Hill (the hill continuation from the Fleet towards Pulborough). This is due to work to repair a gas leak on the main supply. The sgn no. for information is 0800 912 1700. However any updates from them will be posted here when they are received. Fittleworth Stores - the Post Office is now open!